I just made me some of the best tasting pasta I think I have ever had. It was gooooooooooood. I have always wanted to post a recipe on this blog because I do a lot of eating and a lot of experimenting with yummy entrees...and this one? Well...I think it is totally post worthy. I made a few modifications on the original recipe, like using fresh ingredients instead of canned or jarred, so I will just post it as I made it. I would have included a picture of the deliciousness, but it doesn't look like anything spectacular on a plate and I really haven't figured out how to make food look good in a picture. So...this picture of my plant Zeke will have to do. He has followed me through many moves and transitions over the past 7 years and he deserves a little recognition. 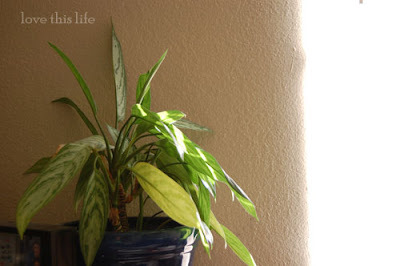 Plus...plants and sunlight are always a good combination, aren't they? 1. Cook pasta according to package directions. Drain; cover and keep warm. Meanwhile, in a large skillet, cook garlic in hot oil for one minute. Add chopped jalapeno pepper* and cook for another 3 minutes. Add fresh tomatoes, dried tomatoes, sherry, parsley and basil. (I also added some Italian seasoning for good measure). 2. Bring to boiling;reduce heat and simmer for 10 minutes, stirring occasionally. Stir pasta into tomato mixture and toss gently to combine. Sprinkle with cheese and serve. *I was a little more generous with the jalapeno pepper as well...cause I like-a the spice! A perfect blend of southwestern spice and traditional Italian. That looks yummy! I am always looking for more recipes. I am loving seeing new posts everyday again! yum, yum! i think i will try it out soon! It does sound yummy! I think I need to try this too!